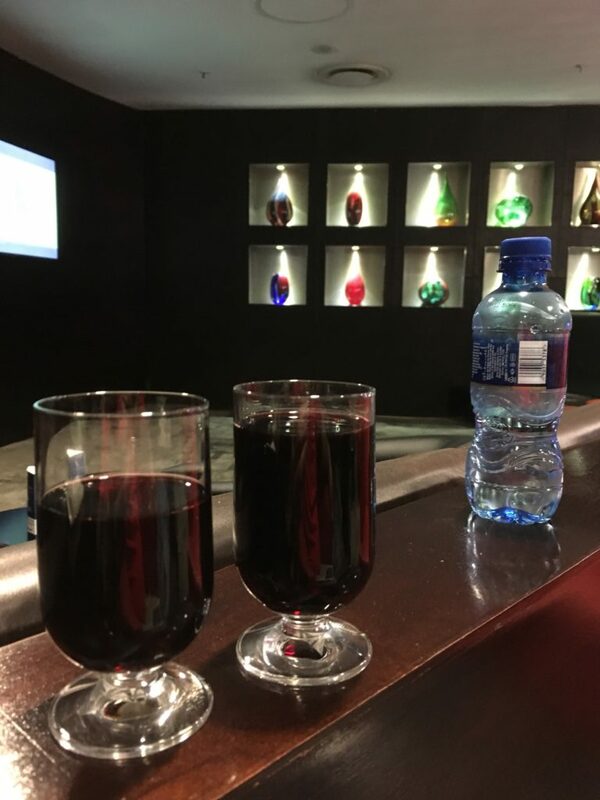 Apparently I looked thirsty, because I’d barely taken a sip when 10 minutes later he returned with another glass. 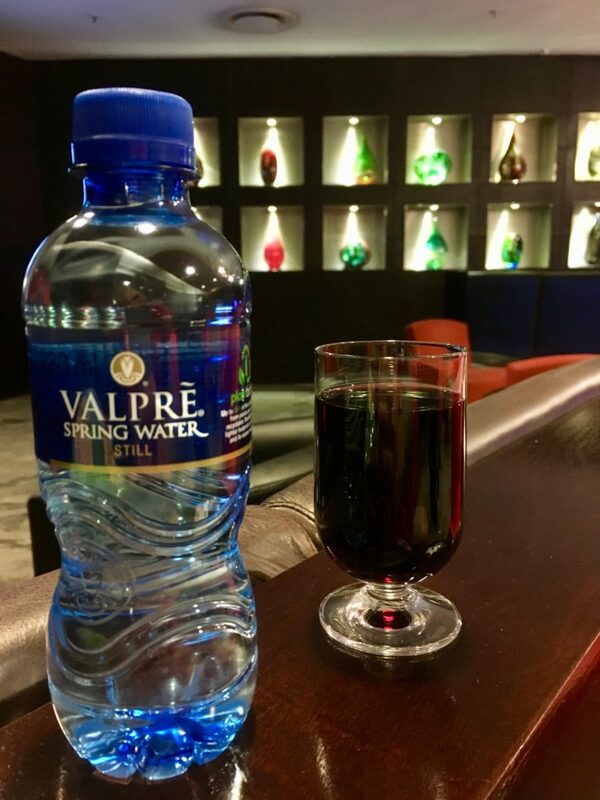 Did I mention how I love the service in this lounge? 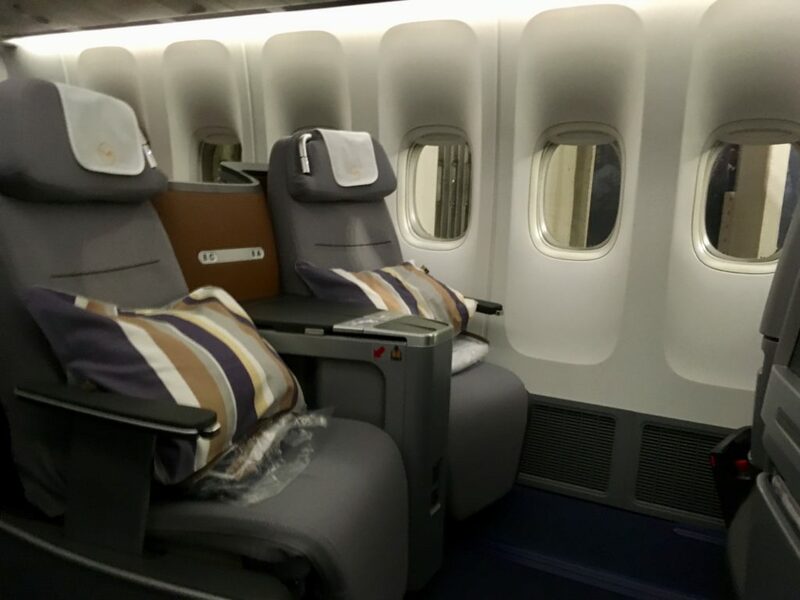 I rather like the 2-2-2 configuration on the Lufthansa 747-8i, and no it’s not all aisle access, but the seats in the middle section have a ton of space. Sitting in the window seats is definitely cuddle class. Yuck. 2005 called, it wants its seats back. 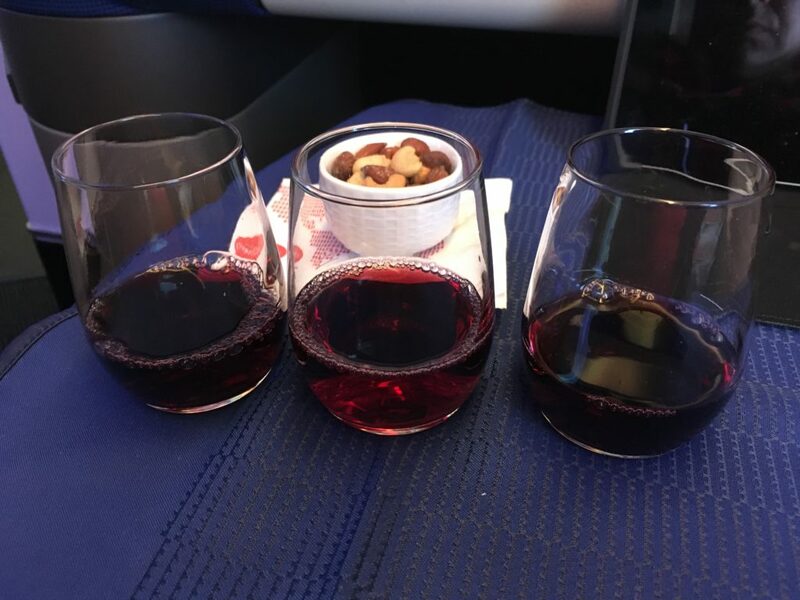 Pre-departures were offered, and I accepted a glass of the (warm) sparking wine. It got two sips and that was it. Ugh. 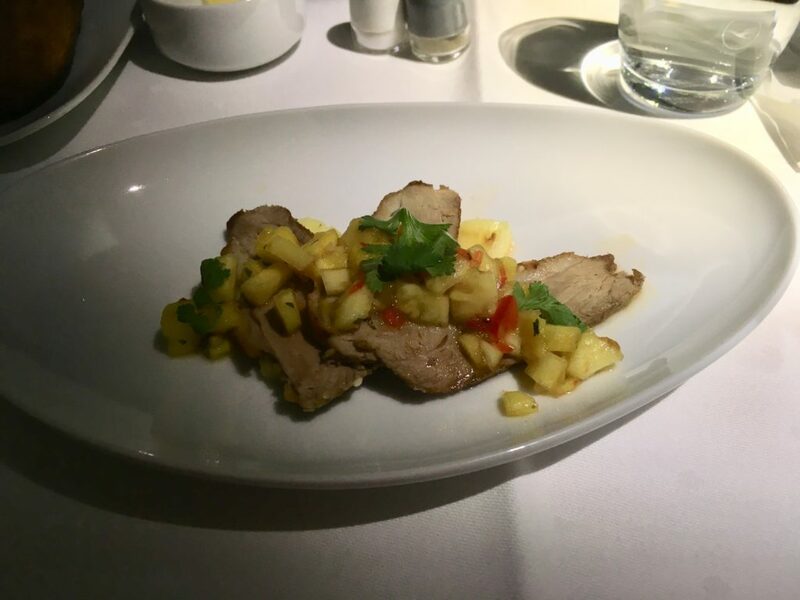 The salad and the main were served together, and both were quite tasty. 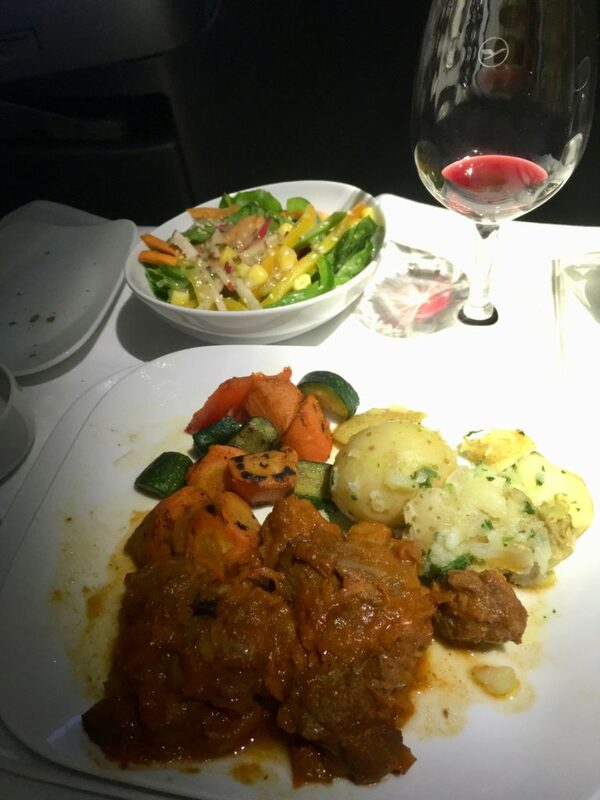 The beef goulash was also a nice non-traditional choice and a welcome change from the usual chicken or beef madness. 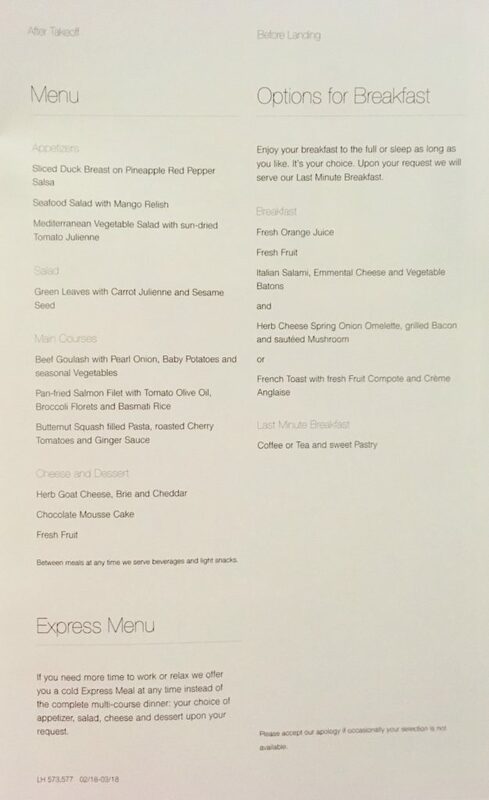 Wow, a business class salad with more than three ingredients. 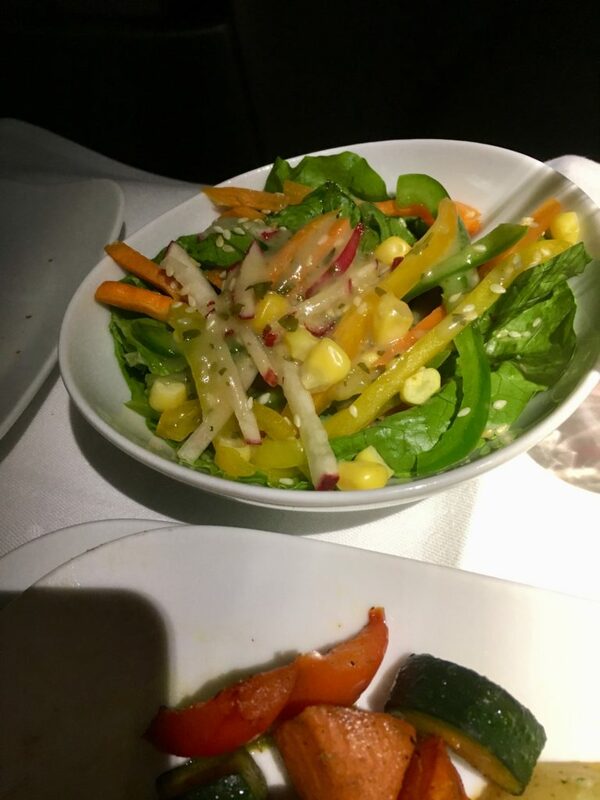 One of the better business class salads I’ve seen in a long time! 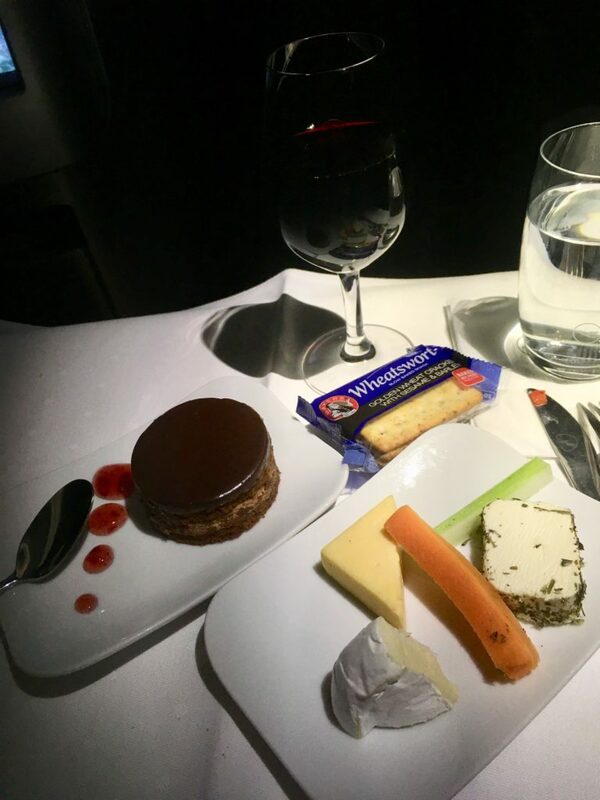 Above average business class cheese plate (but sadly no fig spread), and a delicious chocolate cake to finish off the meal. 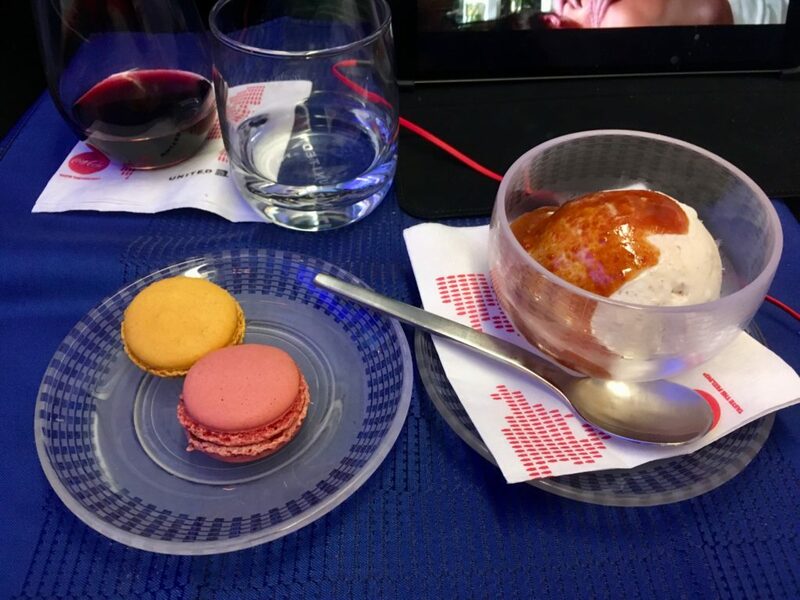 Now, having not died in the middle of the night – or forced a medical emergency landing in Niger (seriously, they probably would have kept going, because, let’s be honest…), it was finally time for breakfast. 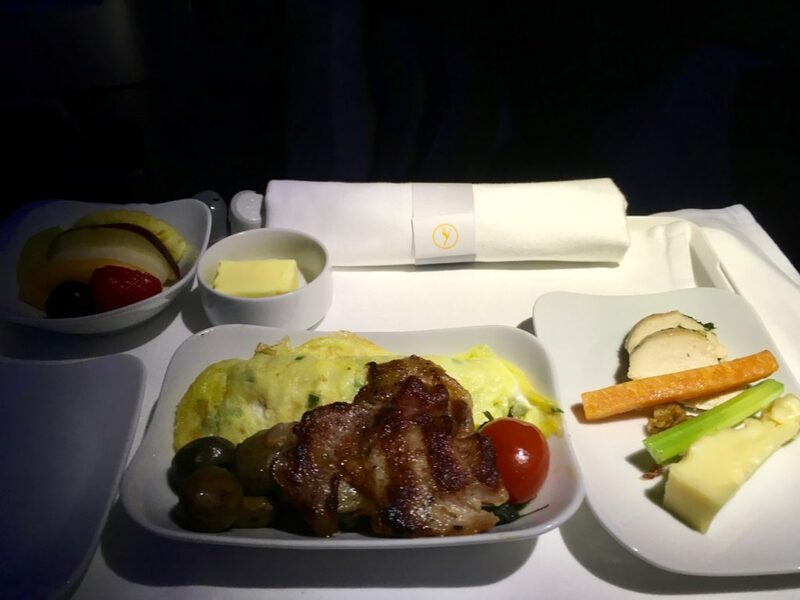 Despite being dark out, nearly two hours before landing (mind you, 3:30am – no time change) they turned on all the cabin lights and brought round breakfast. The omelette came with super tasty grilled bacon (though almost tasted more like a pork cutlet) and some cheese and fruit. Overall a rather impressive breakfast! We landed about 15 minutes early, no line at all at at immigration, so I decided a proper sleep would help, so I headed to my semi-regular haunt the airport Sheraton to get four solid hours of sleep. 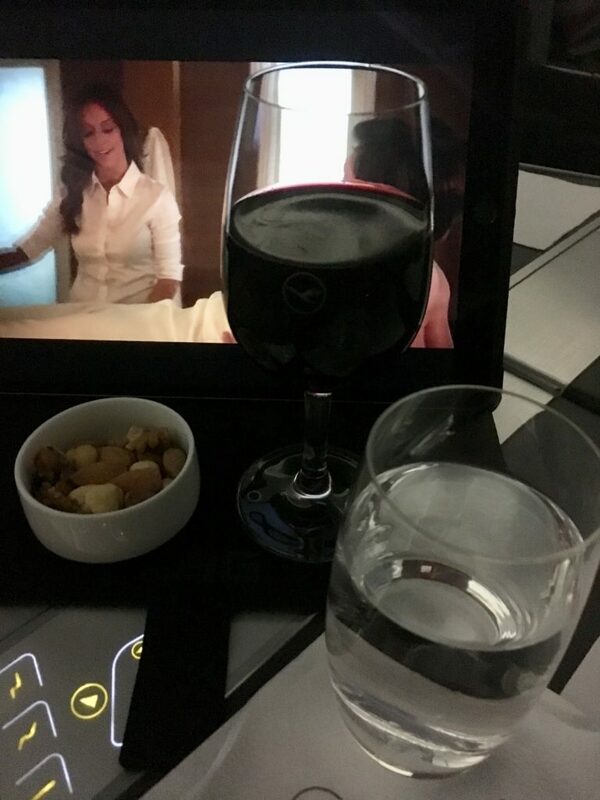 I had just under six hours between flights, and that was way too long to sit in the lounge, and I figured 3.5 to 4 hours in a bed would make me feel human for the flight home. Crashed as soon as I hit the bed, got four solid hours, and was worth every cent. Off to immigration and security which had zero line, and I actually had time for 20 minutes in the lounge on the way to the gate. Could have slept more, but had no way to know there would be no lines. Right, on to the flight. 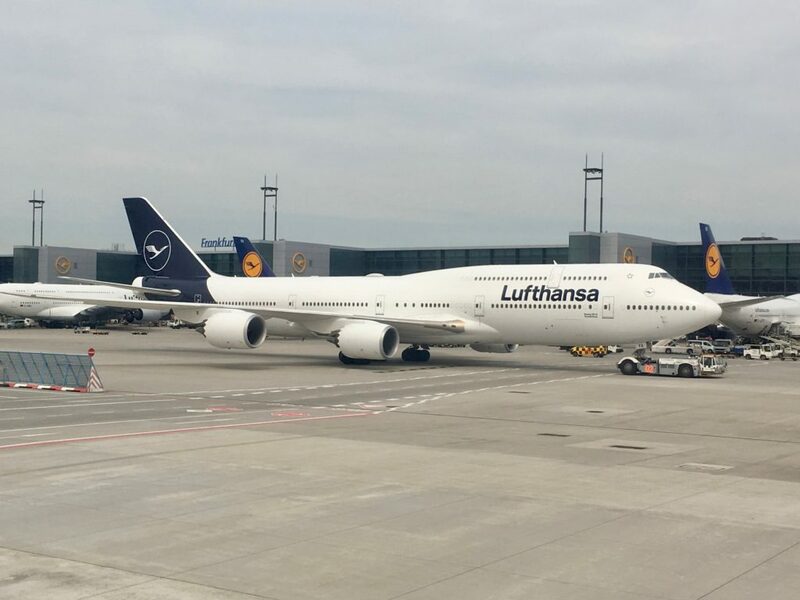 We taxied past the new Lufthansa livery…I don’t hate it as much as others do, but think it was a giant waste of branding budget. Above average salad (I’m always a sucker for a greek salad), and extremely sad appetizer. One sad wilted basil leaf, two slices of underripe tomato , a glop of gelatinous balsamic, and some mozzarella. 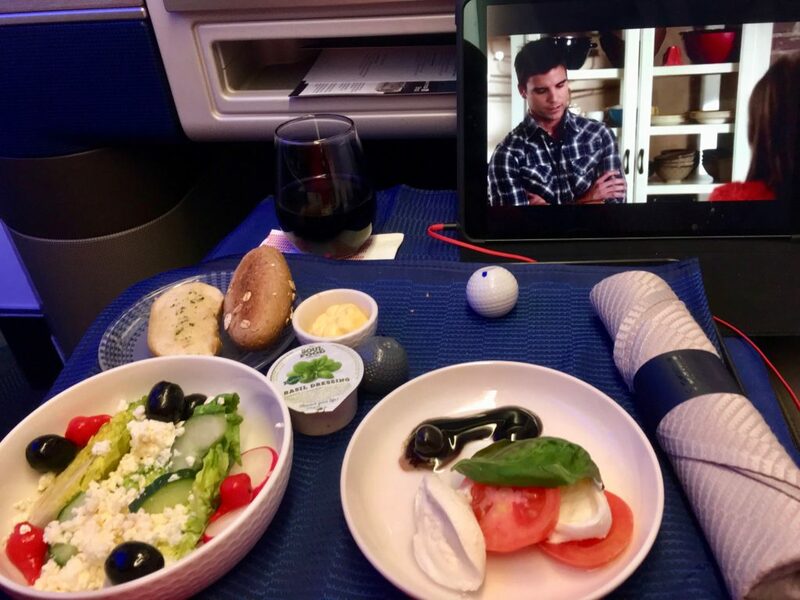 The mozzarella was good at least…the rest was embarrassing. I went with the short rib, knowing it would be essentially the same short rib from the last five years. It was, although very overcooked today. 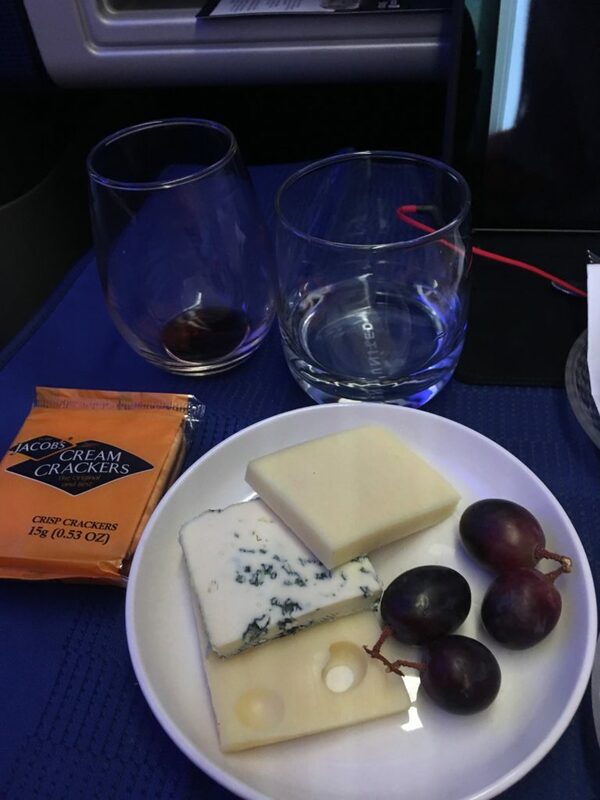 Rather sad cheese plate, but because I’m a sucker for all the varieties they had, I’ll give that a pass! At this point, the internet STILL wasn’t working, so finally the purser offered me compensation and an apology. 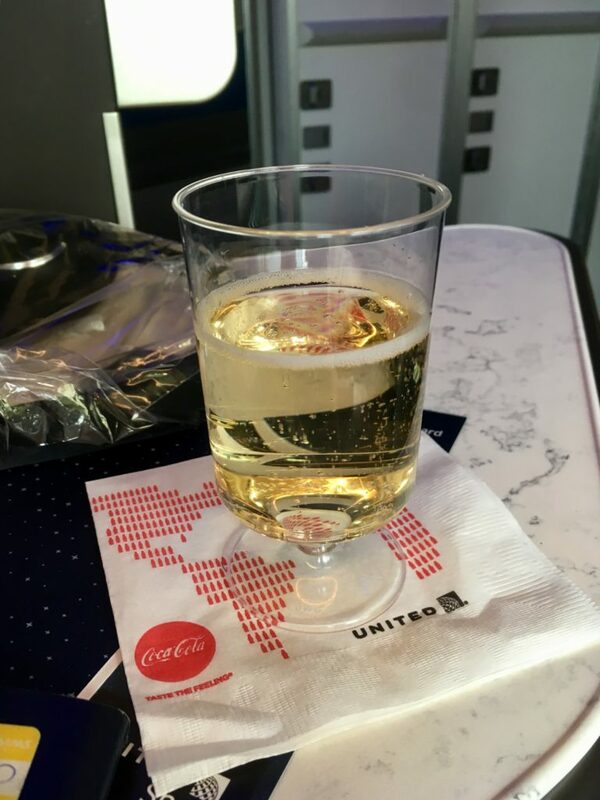 The crew was absolutely fantastic on this flight, and really apologetic, but the frequency with which United has problems even on new planes is embarrassing. Nope, I’ll continue to book away from them whenever possible. To add insult to injury, the new compensation offers are laughable and insulting. 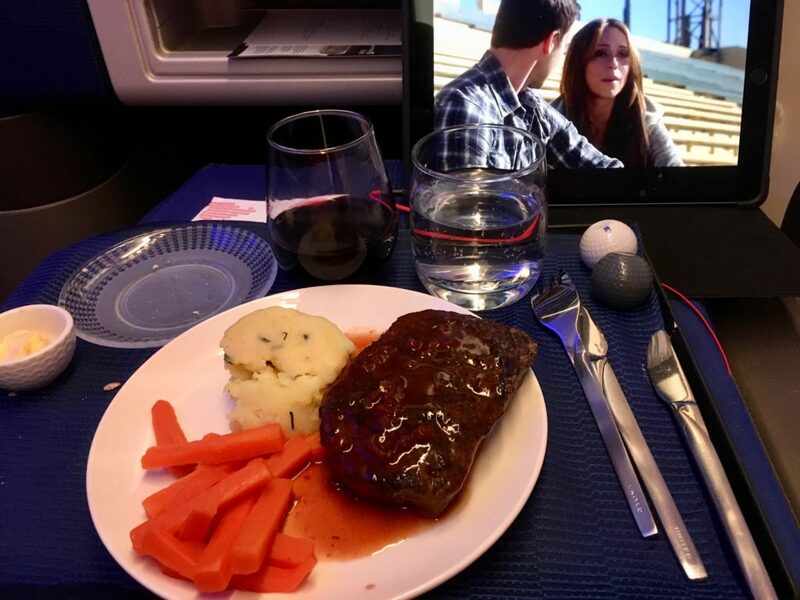 As a 1K only $75 travel voucher or 3,500 miles? Just insulting for eight hours of missed work time. Pre-arrival “deli plate” was not bad, and a nice lighter option. There was also a heavier-sounding option of a sandwich, but honestly this wasn’t bad. Though, the silly pre-packaged polaris chocolates are a sad excuse for a dessert. 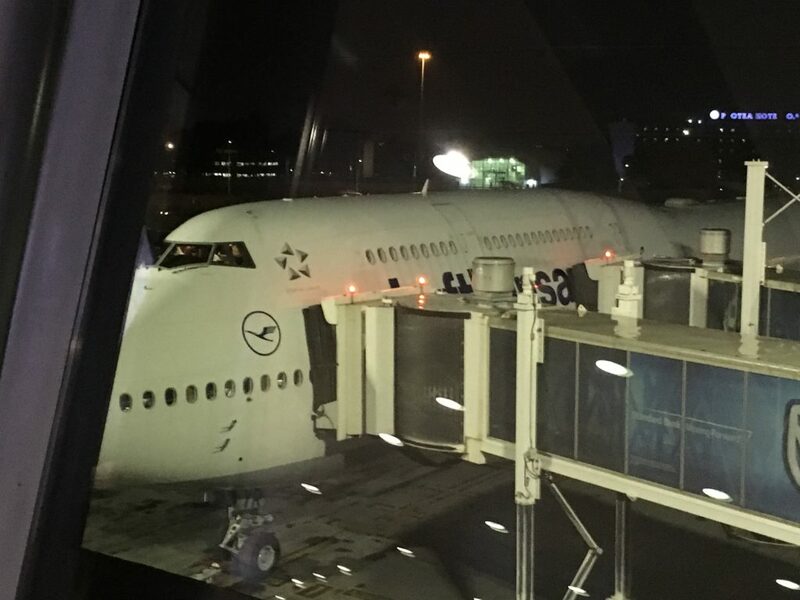 We landed at Newark slightly early, and pulled into a gate in the B Terminal. It seems like United has been using the B Gates for international arrivals lately, and I assume this is to relieve overcrowding in the C Customs Hall? Anyone have more insight into this? This was my first entry to the US since getting my Global Entry reinstated on appeal after a rogue agent revoked it, and I was curious to see how it would go. Couldn’t have gone better, nice and quick, and I was literally plane to landside in 10 minutes. Score! Of course, this meant waiting for the airtrain to Terminal C, and then dealing with Terminal C security, which took 40 minutes even in the TSA PreCheck line. sEWaRk indeed – what a disgrace. Shame this airport and LaGuardia represent our great nation. The Port Authority, however, appears to be making me into a national hero. 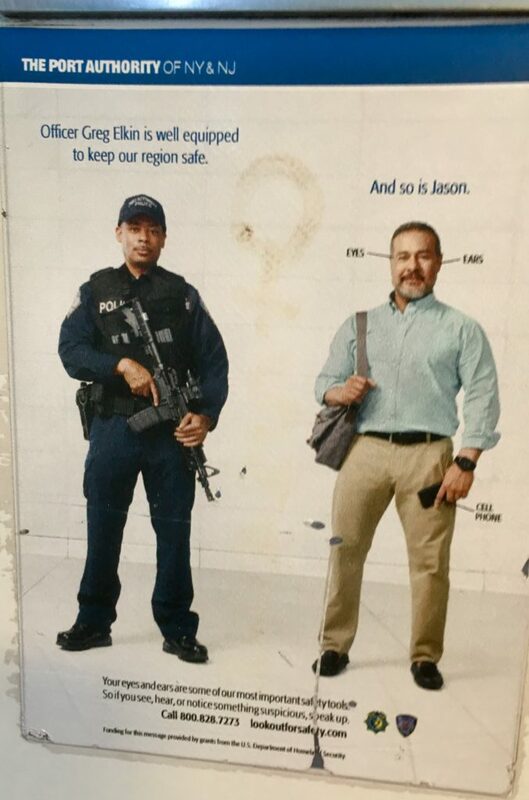 Armed with my cell phone, eyes, and ears I shall protect America’s airports! 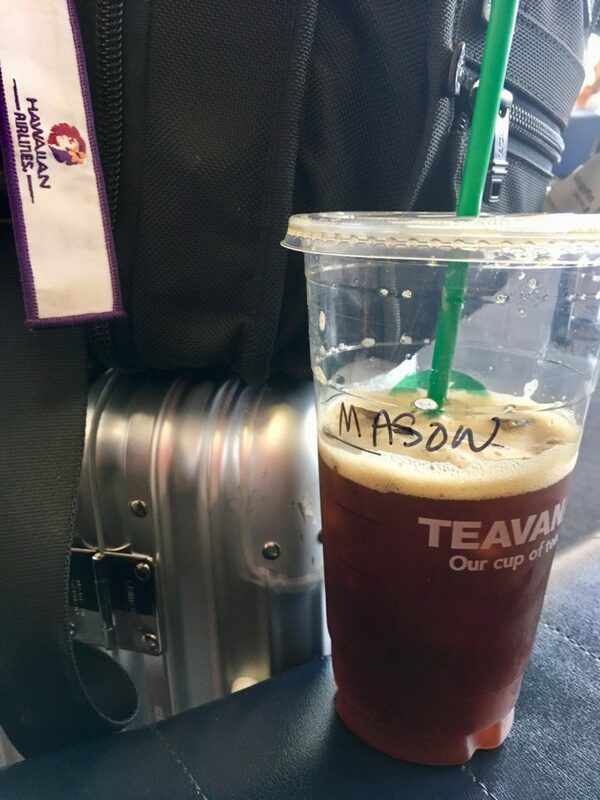 Oh wait, never mind, apparently that’s Jason’s job, and I’m just Mason. With that, it was a super nice treat to get a 737 from Newark to Washington National. Back around 2005 this used to be the norm on this route for Continental, but ever since the merger it’s been an endless stream of ERJ-145s with the occasional ERJ-170 thrown in for good measure. So this was a pleasant treat, and a really nice way to end what was a really nice trip.! Now, with that, I have no travel booked for 4.5 weeks…and I can’t imagine that will last so….stay tuned!! nothing like the security theater combined with the name butchering of Starbucks…two of the most American things I know-makes me proud to be from here. 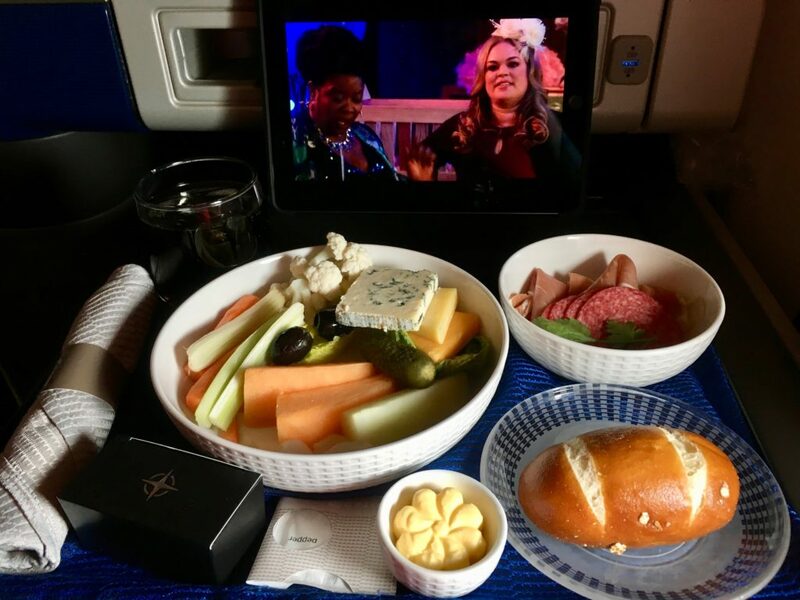 Howcome you are so interested in taking photographs of aeroplane food? 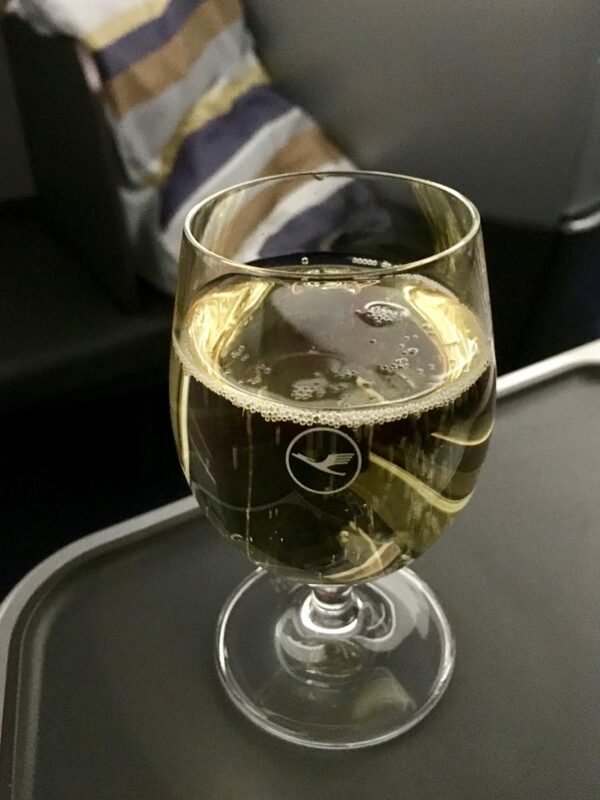 Few more unexpected days in Johannesburg Liechtenstein and Helsinki…via Johannesburg? !